Field Day 2014 - Wow! That's all I can say - wow! A magnificent time was had at the first Field Day for the South Plainfield Radio Club. I posted the following to QRP-L, and I'll insert some other thoughts at the end. 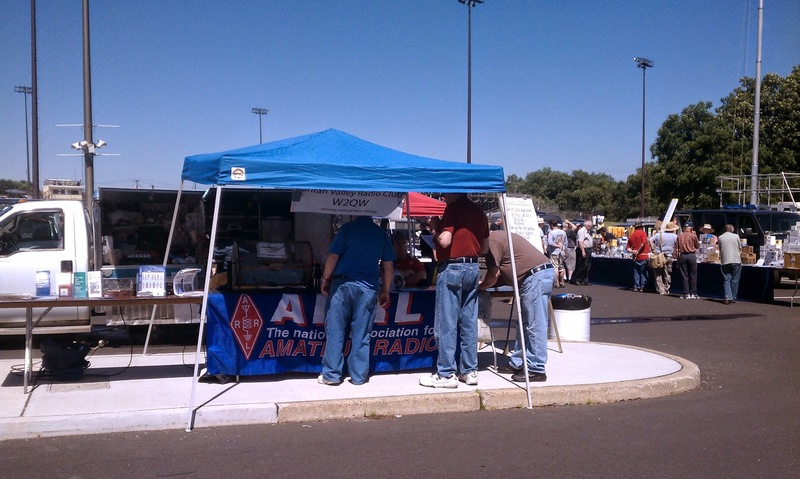 The South Plainfield Amateur Radio Club operated Field Day in Spring Lake Park in South Plainfield, NJ. We used Club call NJ2SP, and ran as 2A (Battery). The "2A" were two Elecraft KX3s. The CW station ran to a EARCHI antenna (53 foot radiator, 9:1 UNUN, 25 foot length of coax). The elevated end of the EARCHI was about 30-35 foot up in a tree. The SSB station used a G5RV, about the same height between two trees. Our operating position behind our club banner. And if you look closely (click on the picture for a bigger image) you can see the EARCHI antenna sloping upward and away towards the tree it was anchored in. The EARCHI antenna was a resounding success. The KX3's internal tuner handled it exceedingly well on all bands. We made just a tad over 270 CW QSOs, with our best DX being Hawaii, Puerto Rico, the US Virgin Islands and the Cayman Islands. Dave W2OIL and Marv K2VHW working on deploying G5RV feedline. The G5RV worked exceeding well, also. The KX3 again tuned without a hiccup. The SSB team completed just over 100 SSB QSOs - these guys are all QRO ops and they were skeptical about completing even a single QRP SSB QSO. They ended up surprising themselves, and they ended up being quite amazed at what they were able to accomplish. Yes, it was not as easy as using 100W rigs, but even in keeping with the ARRL's 5 Watt limit for the battery category, they were quite pleased. We operated on solar charged batteries all weekend without a hitch. The energy hogs for the weekend were the two laptops that we used for logging. The Field Day rules state that since we were not using the laptops for rig control, we could have powered them from mains (which we did not have) or a generator (which we had, but didn't use). In keeping with our self imposed "severe emergency capability" theme in order to make this a drill as much as possible, we also powered them off a deep cycle battery using an inverter. We needed to switch the laptops over to a fresh battery somewhere in the mid morning hours, Sunday. SPARC's first Field day was an outstanding and unqualified success, and I think we 'busted' the myth that Field Day has to be QRO to be fun. The EARCHI worked great and way better than I dared hope for. With less exceptions than I can count on one hand, I was able to work everyone that I tried to. Being on an energy budget because of the batteries and wanting them to last all weekend if possible, I didn't try calling CQ or running a frequency (it was S&P all weekend). I will reserve that for FOBB and the Skeeter Hunt, which are only four hour events. I can afford to be a little "battery foolish" during those, and I expect the EARCHI to work just as well during those two events. The other Godsend of the weekend? That Joplin ARC antenna launcher kit that I purchased and built up. We were able to place antenna lines pretty much exactly where we wanted with hardly any effort at all. That thing is one of the greatest things since sliced bread! One or two of the guys were skeptical about being able to place an antenna line so easily and accurately with such little effort. The old saying is "That seeing is believing". They're believers now! The VHF/UHF antennas for our GOTA station. Protection from South Plainfield's Finest! We had wonderful support from our Mayor, Town Council, Office of Emergency Management and our Police Department. They even parked a car by our site for the overnight, to act as a deterrent against any potential mischief makers! Tim AB2ZK making SSB QSOs in the dead of night. Marv K2VHW taking a late night turn at the CW station. Dawn breaking over South Plainfield on Sunday morning. After being awake for 24+ hours, I fell asleep while waiting for the Mayor to show up late Sunday morning. I woke up in time for his visit, though! Being in the park, we had a lot of curious people come by. We answered any and all questions and we handed out quite a bit of ARRL printed material about Amateur Radio. An encouraging sign was that several parents came by and wanted more information for their tech minded offspring. Squeezing out some last minute QSOs as Field Day draws to a close. Tim AB2ZK on phone, W2LJ on CW. The moral of the story is that Field Day is fun! It doesn't have to be elaborate to be a success. With two wire antennas and two QRP rigs anchored at 5 Watts, we had a blast. Oh, and we made the local paper, too! http://tinyurl.com/ls56z6u Some of the details were not exactly reported accurately, but it was good exposure for Amateur Radio nonetheless! In closing, I'll answer a question that was posed to me by a member of the visiting public, the way I wanted to answer it. A woman asked me if it was a bit extreme staying awake throughout the 24 hours of Field Day. Of course, I gave her the answer of "In the event of an emergency or a natural disaster, sleep may very well be a luxury, ......." Yadda, yadda, yadda. 1) It's Field Day! Sleep is overrated! 2) Heck no Lady! Field Day is fun! 3) Ma'am? I'll sleep when I'm dead! One final, last added mention. Last year, Marv K2VHW introduced me to Deep Woods Off moist towelettes. They are a must for the Field Day Go Package. They worked extremely well, and I was not bothered by a single "Skeeter" (pesky little fellows, I should have had them pound brass!) all night long. Field Day is two days away and the weather here is supposed to be gorgeous! Psyched! 36 intrepid souls have signed up for the 2014 NJQRP Skeeter hunt since the opening bell rang early yesterday morning. And I am proud to say that one of our Skeeters this year is Mr. NJQRP himself. George N2APB sent an e-mail and was assigned Skeeter #29. I also see that several of my fellow QRP Polar Bears have signed up for numbers, too. These guys are fantastic and are never ones to miss the opportunity for an outdoor QRP adventure. Thank you fellow Polar Bears - grrrrrrrrrrr. Will be looking to join you in swatting Skeeters from bear hide this August. I'd like to take this opportunity to "borrow" and old New Jersey slogan. This was an advertisement that ran back in the days when Tom Kean was governor and it was designed to increase tourism in NJ. It went like this, "New Jersey and you ..... prefect together." If I may, this kind of sums up the whole idea and intent behind the NJQRP Skeeter Hunt. 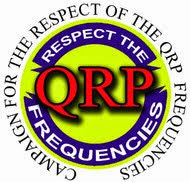 "QRP and the great outdoors ..... perfect together!" Join us and see for yourself. MONDAY MORNING IMPORTANT UPDATE: Argggghhhhh! I went to my spam file this morning and found about 20 Skeeter Number requests that were sent over the weekend. I didn't know they were there, and I didn't even think to check there until this morning! So if you sent me an e-mail request over the weekend and still haven't heard from me .....you will tonight. I promise! Summer - it's finally here! After a long, cold Sprinter (that's what you get when Winter seems to last endlessly into Spring), Summer is finally here! Yay! And as promised, as of today, numbers are being assigned for the 2014 NJQRP Skeeter Hunt. The Hunt will be held on Sunday August 10th this year - and right now, the best place to see the rules is at http://w2lj.blogspot.com/p/njqrp-skeeter-hunt.html. I am trying to get the QSL.NET page updated with the new bonus points rules, but the server seems to be down right now. Yes - bonus points this year for gathering enough letters from callsigns to spell out the word "SKEETER". 100 extra points will be added to your score if you accomplish this feat. 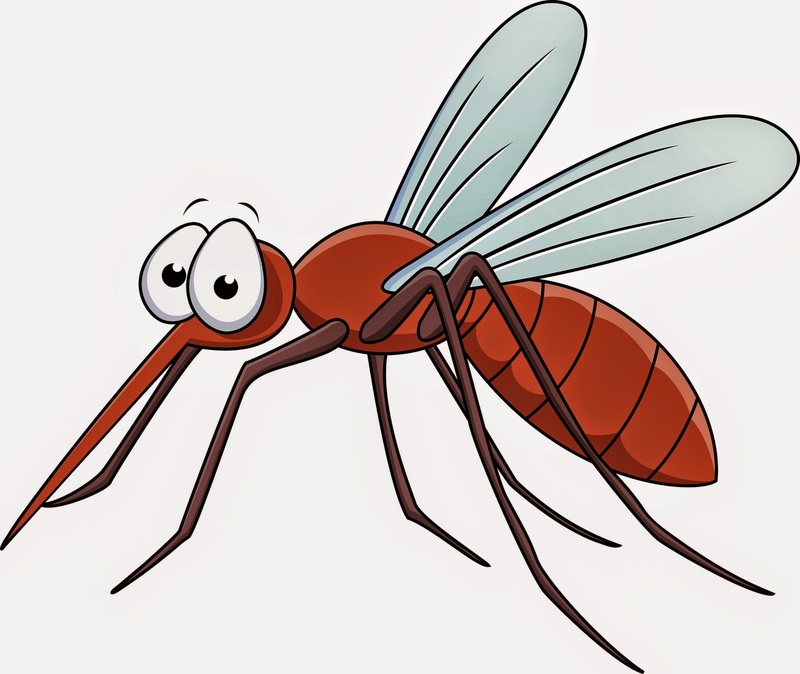 In any event, the NJQRP Skeeter Hunt is a grand time and folks seem to enjoy themselves a lot, so send me an email (w2lj@arrl.net) and reserve your Skeeter number today. 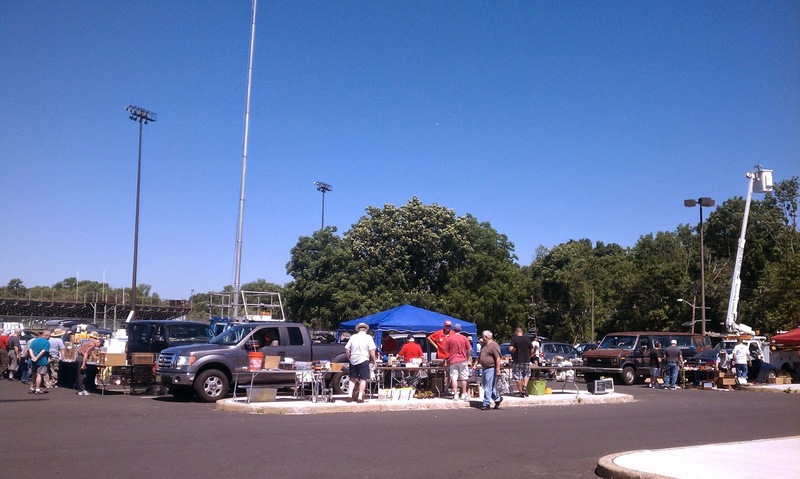 Today was also the Raritan Valley Radio Club annual hamfest, which is held at Piscataway High School, in Piscataway, NJ. The weather was absolutely beautiful - perfect for a hamfest! It was sunny and it got up into the high 70s. Very nice, but yet not exasperatingly hot. And as you can see from the two quick photos that I snapped with my phone, there was not a cloud in the sky. Unfortunately, it was perfect sunburn weather. Reporting time for the hamfest workers was 5:00 AM and as I was driving to the hamfest site, I had realized I had forgotten to bring sunscreen. I discovered the hard way that there are NOT a lot of places open at 5:00 AM where you can buy sunscreen! There were plenty of vendors and lots of buyers. The ARRL had a presence with the appearance of Bill Hudzik W2UDT, our section Vice Director. (Psst! It helps that he's a club member!) We also had a VE Exam session, where three people earned their Technician licenses, and we also had one upgrade to General and one upgrade to Extra. In the top photo, you can see the huge mast sticking up from an old broadcast van that Brian N2MPM had acquired. Running up the mast was a PAR END-FEDZ antenna that Alan W2AEW using to make QRP contacts. If you follow this blog, you know that I have mentioned Alan's YouTube videos in the past. He does an excellent job producing videos on how to use test equipment and other neat technical tutorials. If you haven't subscribed to his YouTube channel, then you are cheating yourself. After you read this go over and subscribe - it's definitely worth it. Pulling off a hamfest like this is a huge undertaking. Thanks to the direction of our two Hamfest Committee Chairmen, Drew W2OU and Rich W2PQ and all the members of the RVRC, this comes off flawlessly - year after year. 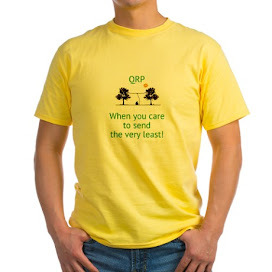 QRP - When you care to sedn the very least! I suppose it can. 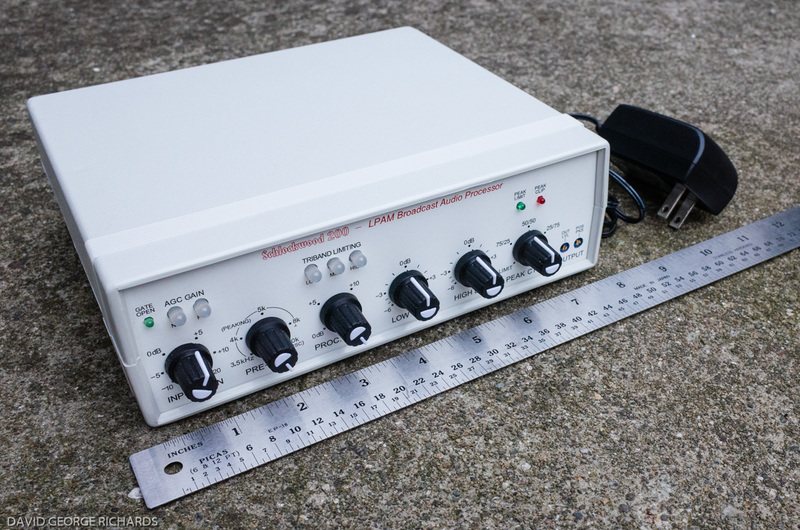 I suppose one could make DXCC Honor Roll, or perhaps get elected to the QRP Hall of Fame, or perhaps invent some cool, new piece of QRP equipment that the world will beat a path to your door for (and make you some $$$ in the process!). But for a Ham an' Egger like me, the best is just getting on the air making contacts - ANY kind of contacts. DX quickies, ragchews - whatever. It's all good. And today was another comparatively good lunchtime QRP session. I worked RZ1OA, Vlad in Russia, and I worked XE1XR, David in Mexico. Two good, solid DX contacts. The best QSO was the last one, and it was not a DX contact. In fact, the miles covered were only about 650. But it was exciting, fun and satisfying nonetheless. After working the two DX stations, I decided to go to on down to 20 Meters to listen perhaps for some SOTA stations. That's when I heard a weak, but very copyable KC8JNL calling CQ right at the QRP Watering Hole. I answered and hooked up with Pat who lives in Rothbury, MI. Not as distant as Russia or Mexico - definitely. But this QSO was exciting in and of itself, because Pat was using a Rockmite at QRPp power levels. There was some vicious QSB, and I didn't quite copy Pat's power output level. Having my own 20 Meter Rockmite, I knew it had to be under 1 Watt. Pat gave me a 559 and I gave him a 459 in turn. The QSO would have been Q5 copy both ways if it weren't for the QSB. But even with the fading, I knew what Pat was saying to me, and from his answers, I had a good idea that he was making me out just as well. 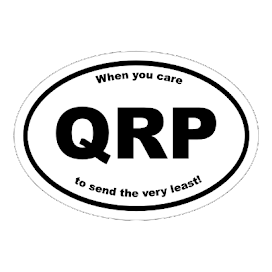 QRP to QRP, or QRP to QRPp, or even QRPp to QRPp QSOs get my wonderment juices all fired up. That we can effectively hold a conversation using such little power is still an amazement to me after 36 years in this hobby. It's truly like .... can it get ANY better than this? (My apologies for speaking like a teen - having two, it tends to rub off). I talked with Pat and Vlad and David today, all while enjoying the sunshine and the 80F (27C) temperatures that we are having here today. No wires, no cell towers, no infrastructure of any real sort ..... not much more than two guys shooting a bunch of electrons out of some wire or aluminum - hoping that they'll bounce around to and fro, and eventually be picked up by a like minded enthusiast - somewhere. After being stuck inside during lunchtime last week, due to workload and/or weather, I was finally able to get out today. This was the first opportunity (if you don't count the weekend) that I had to try out the tri-magmount with the Buddistick since changing out the coax. Well, it was the coax that was giving me fits. With the new coax, the KX3 tuned the antenna in mere seconds and once it tuned, it stayed tuned. No phantom jumping SWR values, everything behaved nicely. For my efforts, I was able to work W1AW/5 in Arkansas on a different band, Don K2DSV who is a fellow K2ETS Club member, as well as XE2ST, Fernando in Nogales, Mexico. So I am considering the surgery that I performed on the antenna base to be an unqualified success. I really believe that I saw that change in the mid 90s, though. I joined a couple new clubs and was welcomed. Even though I was licensed for quite a while by then, I was still a neophyte compared to the established "Old Timers" who were a large part of the membership, and I was a comparative stranger, to boot. But in both cases, I was welcomed warmly - I was not shunned, I was not looked down upon, I was accepted into the groups without question. And that's the way it should be. 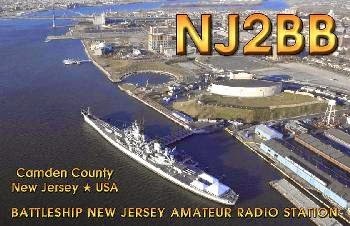 I currently belong to three active local clubs - the K2ETS Electronic Testing Society of NJ, the W2QW Raritan Valley Radio Club as well as the NJ2SP South Plainfield Amateur Radio Club (which I helped to establish). Since SPARC is so new, I am going to leave it out of the mix for this discussion, but the same philosophy holds there, as well. In both K2ETS and W2QW, newcomers are welcomed enthusiastically and with open arms. There's no "we vs. they" mentality when it comes to new members. Everyone is encouraged to participate, and everyone is listened to. Your age, your gender, your level of experience is really of no matter. I really don't see any wide gulfs when it comes to "new" vs. "old" technologies, either. Those who primarily operate HF only seem to peacefully co-exist with those who like to experiment and build and toy around with Arduinos, Raspeberry Pi's and the digital voice and data modes. In fact, I see a lot of the groups co-mingling and getting pointers, answers to questions and operating tips from each other. Just the way it should be. Newcomers are welcomed for their new ideas and enthusiasm while "Old Timers" are respected for their experience and built up wealth of tribal knowledge - again, just as it should be. Guess I've been very fortunate to not be involved with "cliquey" organizations. Hopefully, that is becoming everyone else's experience as well. Summer 2014 starts this coming Saturday at 6:51 EDT. After this dreadfully long Winter that seems to have lasted into Spring, I just can't wait! At that bleary eyed time of the morning, I will be busy, helping out at the annual Raritan Valley Radio Club W2QW Hamfest. But Saturday, being the first day of Summer, is also the day that I will entertain requests for Skeeter Hunt numbers for 2014. So please feel free to send e-mails to w2lj@arrl.net, and as soon as I can, I will get back to you with your official NJQRP Skeeter Hunt number! And I can tell you one thing that is 100% certain. With the Winter of 2013/2014 still vividly fresh in the ol' memory banks of W2LJ ..... no matter how hot or how humid it might be for this year's Skeeter Hunt, I for one, will not complain! I decided that I wanted to try something new paddle-wise for my lunchtime QRP portable operations. The main criteria was that it had to be on the inexpensive side. That seems to be my main criteria these days where a lot of things are concerned. Besides working well, it would also be nice if the paddle was light in weight. Palm paddles would probably be the ultimate, but are way too expensive and would not fit within my meager budget right now. I needed to keep it under $50 if at all possible. That really narrows down the possibilities, let me tell you. 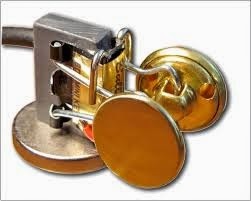 I have a Whiterook MK-33 single lever paddle. It works well and it also fits the bill, but it tends to get a bit sloppy around the 22-23 WPM mark. I had a Bulldog paddle back when I had my K1 and I liked it. However, I included it as part of the K1 package when I sold that radio to raise money for my KX3. So, relying on my memory, I decided to give another Bulldog a try. I went to the Website: http://www.amateurradioproducts.com/, only to find out that they no longer manufacture the model I had. Mine was the one on a small triangular wooden base that had three tiny suction cups. They have several different models now, and I decided to go with the BD6, the Mini-Iambic. It arrived on Saturday through the mail, and tonight was the first chance I had to try it out. I have to admit that I was skeptical when I opened up the package that it came in. It is indeed 'mini" - in fact, it gets lost in the middle of the 1.5 inch fender washer that serves as a base! But as usual, it turns out that looks are quite deceiving. This little paddle is smooth and is great to use just as it is, no adjustments were required, although the accompanying instruction sheet tells you how to go about that, if needed. I worked both W1AW/5 and W1AW/0 tonight at about the 21 WPM range. The paddles acquitted themselves nicely there. Then I turned up the speed a notch to work EV1R and LZ1WR and C6ATT. Even at the speed where the Whiterook goes kaflooey on me, the Bulldog stays sharp, smooth and flawless and had great feel to it. The fact that it was only $35 was icing on the cake. I will definitely bring these along for Field Day. They may be too small for some of our guest operators, but they work great for me! I attended the Town Council meeting in South Plainfield, NJ. Our mayor issued a proclamation declaring June 23rd through June 29th as Amateur Radio Week in South Plainfield. Most of the members of the South Plainfield Amateur Radio Club were on hand, and we had our picture taken with the mayor. The red mark shows the gazebo from where we will be operating. The tree directly to the left of the gazebo is about 75 feet away. This will be the support for the EARCHI end fed antenna for the CW station. The trees "above" the gazebo are almost exactly 100 feet apart and will support the full sized G5RV, which will be used by the SSB station. We have invited the mayor and members of the Town Council to come out and visit the site on Sunday morning, as this was the time most convenient for them. We have also invited several officials from the Hudson Division to come by and visit us also. In addition, I have spoken to one or two of the Scout Leaders in town and have invited them to bring their troops by for some "hands on" radio experience. Due to the effort put forth by my fellow members of SPARC, what was proposed as a "Field Day on the Fly" operation is taking shape rather well and is coming together very nicely. We're looking forward to not only having a lot of fun, but also to presenting a very favorable view of Amateur Radio to any and all passers-by. Is THIS weekend! Booyah! See how many you can work - you can get a certificate for working 15 or more. The link down below has all the official intel. even when it seems like there's nothing out there. You never know what might come up! It's a beautiful sunny day here in Central NJ, so as per my custom, I headed out to the Jeep, the KX3 and the Buddistick at lunchtime. From the get go, it seemed very disappointing. There wasn't a whole heckuva a lot of DX activity. What I was hearing were stations I have worked before and you don't want to keep pestering guys on the same bands, just to get a contact in the log. I started calling CQ at the 20, 17 and 15 Meter QRP watering holes with no takers. I was slightly discouraged (Momma said there'd be days like this), and was ready to pack it in and head on back to my desk, slightly early. That's when I decided to give 17 Meters just one extra twiddle before coming in. Bam! There was TM70UTAH loud as all get out! 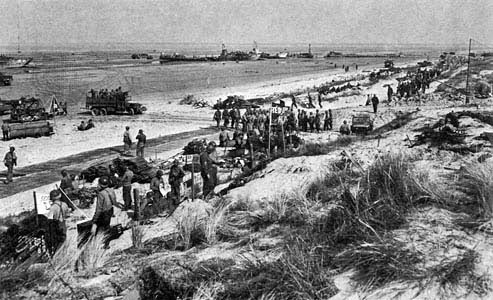 This is a Special Event station, commemorating the 70th anniversary of the Allied landing at Utah Beach on D-Day in 1944. First call and they were in the books! I have to admit, I was so excited when I heard them that I had to send my call a few extra times as I fumbled it in my eagerness to work them. I did hear a confirmation of W2LJ come back to me and I was smiling ear to ear. Next, just a few KHz down, I heard SP3DOF calling "CQ DX". One call and I was in Jerzy's logbook. Wow! A WWII Special Event station and a Polish DX station worked within a few minutes of each other - a red letter day as far as I'm concerned. And all this was after I was tempted to throw in the towel for the day. So it's a good reminder (to myself included) to keep throwing that fishing line back into the water. You never know what's going to land on the hook. The funny thing is, that TM70UTAH wasn't even mentioned in that ARRL article on D-Day Special Event stations that I posted from the ARRL just a few days ago. So in addition to TM70JUN, keep an ear open for TM70UTAH. I would like to work both of them! Marv K2VHW and I met this afternoon to scope out the two parks we have in mind for Field Day. As I had mentioned before, our first choice is Spring Lake Park, which is the property of Middlesex County. That gazebo is huge! It can easily accommodate two large tables for operating, as well as supply space for observers and guests. In addition, there are trees that are close enough to support a full sized G5RV and another to support the EARCHI end fed (more about that later). The other venue possibility, Putnam Street Park, is another excellent site. There is plenty of space, it has high visibility and plenty of traffic. Trees are plentiful and there are restroom facilities on hand. There's only one drawback - a lack of shelter. We would have to borrow or rent a multi-person tent, to have a place to operate in the case of inclement weather. After I got home from our scouting trip, I decided to play for a bit, and try out that 53 foot radiator for the EARCHI antenna. I was hoping that if all worked out, this would be our CW Field Day antenna, as well as what I would use for FOBB and the Skeeter Hunt. My experience today shows that that chart published by Balun Designs was spot on! I quickly got excellent matches with the KX3's auotuner on all the bands almost instantly. 17 Meters was the hardest band to match and that only took about two seconds to accomplish. I made contact with Josh 6Y5WJ and CO0SS on 15 Meters and a PY2 station on 10 Meters. These were made with the antenna at a less than optimal height too, as I used my Jackite pole as the support. Once I get this baby up properly in a tree, it should perform even better. This is an 8 X 3 foot banner made from heavy outdoor vinyl, with grommets and wind slits. If I get approval from the rest of the Field Day Committee, I will place the order tomorrow evening.